3 piece cab HeatShield set for 2015 - 2019 Ram ProMaster City cargo & passenger vans. B Stock item, in like new condition. All sales final. Does not fit ProMaster 1500, 2500 or 3500 vans. 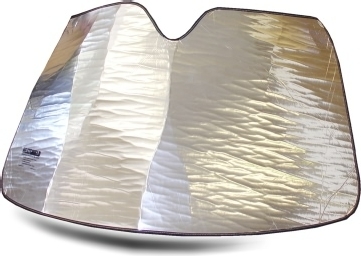 3 piece HeatShield set keeps your interior cool in summer or warm in winter. Includes windshield sunshade, and shades for both passenger and driver side front door windows. Adds privacy while parked or when camping. Windshield piece is ridged and held in place by sun visors. Easily bends to fit behind mirror. Driver and Passenger front window pieces are held in place with suction cups. HeatShields are custom made to fit your ProMaster City - precisely cut using computer-driven cutting machines. Usually ships by the next business day. Please allow 1-5 additional business days for delivery.